HOUSTON  (November 16, 2011)  The Houston real estate market has added reason to be grateful this Thanksgiving season after logging a fifth straight month of positive home sales in October. The year-over-year increase in single-family homes sales, coupled with a rise in pending sales and continued decline in months inventory, signals a market that is benefitting from a healthy absorption of housing inventory. Adding to the positive report is an average price that achieved an all-time high for an October in Houston. According to the latest monthly data prepared by the Houston Association of REALTORS® (HAR), October sales of single-family homes rose 9.1 percent versus one year earlier. All segments of the housing market, from the sub-$80,000 to the $500,000 and above, experienced growth. On a year-to-date basis, sales were up 3.4 percent. "The further we distance ourselves from last year's tax credit as we analyze the local housing data, the clearer an indication we get of market performance, and the latest numbers show a healthy sales climate for an autumn in Houston," said Carlos P. Bujosa, HAR chairman and VP at Transwestern. "As long as the Houston economy continues to strengthen with additional job growth, we can be cautiously optimistic about the state of the housing market going into the new year." The average price of a single-family home rose 1.1 percent from October 2010 to $208,506, the highest level for an October in Houston. The October single-family home median pricethe figure at which half of the homes sold for more and half sold for lesswas unchanged from the October high of $150,000 it reached in 2010. Foreclosure property sales reported in the Multiple Listing Service (MLS) increased 6.0 percent year-over-year in October. Foreclosures comprised 22.0 percent of all property sales, up slightly from the 19 to 20 percent range they have maintained since May of this year. The median price of foreclosures in October was flat at $80,600. October sales of all property types in Houston totaled 4,815, up 8.9 percent compared to October 2010. Total dollar volume for properties sold during the month rose 10.9 percent to $962 million versus $867 million one year earlier. The month of October brought Houston's overall housing market positive results when all sales categories are compared to October of 2010. Increases in the volume of closed and pending sales reflected more normal, seasonal trending after several months in which the data was distorted by the 2010 tax credit that led to a sharp decline in home sales after it expired. Total property sales and total dollar volume rose on a year-over-year basis while the average price climbed to an historic high for an October in Houston. Month-end pending sales for October totaled 3,092. That is up 9.6 percent from last year and portends another positive month when the November sales figures are tallied. The number of available properties, or active listings, at the end of October declined 12.0 percent from October 2010 to 46,674. The inventory of single-family homes dropped to its lowest level since April 20106.6 months, compared to 7.7 months one year earlier. That means it would take 6.6 months to sell all the single-family homes on the market based on sales activity over the past year. The figure is significantly better than the national inventory of single-family homes of 8.5 months reported by the National Association of REALTORS® (NAR). These indicators all reflect a balanced real estate marketplace for Houston. October sales of single-family homes in Houston totaled 4,080, up 9.1 percent from October 2010. This marks the fifth consecutive increase of the year following a 1.4 percent rise in June, 15.3 jump in July and increases of 28.8 percent and 15.2 percent in August and September, respectively. On a year-to-date basis, sales are ahead 3.4 percent. Broken out by segment, October sales of homes priced below $80,000 rose 4.8 percent; sales of homes in the $80,000-$150,000 range climbed 11.5 percent; sales of homes between $150,000 and $250,000 were up 11.8 percent; sales of homes ranging from $250,000-$500,000 advanced 8.0 percent; and sales of homes that make up the luxury marketpriced from $500,000 and upticked up 0.8 percent. The average price achieved the highest level ever for an October in Houston. At $208,506, the average price of single-family homes rose 1.1 percent compared to last October. At $150,000, the median sales price for single-family homes matched its all-time October high set in 2010. The national single-family median price reported by NAR is $165,600, illustrating the continued higher value and lower cost of living available to consumers in Houston. HAR also breaks out the sales performance of existing single-family homes throughout the Houston market. In October 2011, existing home sales totaled 3,434, a 10.3 percent increase from October 2010. The average sales price was unchanged from last year at $194,997 and the median sales price was also flat at $139,500. The number of townhouses and condominiums that sold in October jumped 16.9 percent compared to one year earlier, marking the fourth straight monthly sales increase. The first was a 25.3 percent rise in July, followed by a 20.5 percent increase in August and 14.6 percent gain in September. In the greater Houston area, 352 units were sold last month versus 301 properties in October 2010. 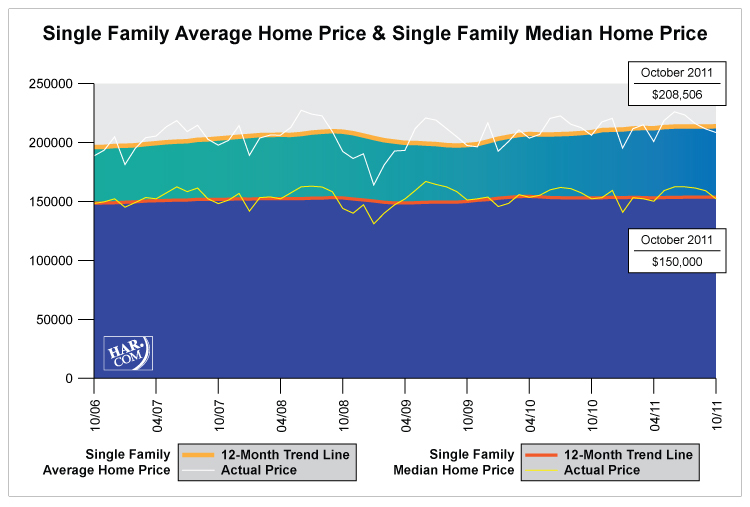 The average price jumped 13.0 percent to $163,221 from October 2010 to October 2011. The median price of a townhouse/condominium rocketed 22.7 percent to $132,500. Both average and median prices were the highest ever for an October in Houston. The trend in soaring demand for lease properties throughout the Houston market continued in October. Single-family home rentals rose 24.8 percent compared to one year earlier and year-over-year townhouse/condominium rentals climbed 18.5 percent. HAR has reported throughout much of 2011 that this demand has been largely driven by steady improvement in the local employment landscape, with REALTORS® observing a surge in consumers relocating to Houston from around the U.S. According to the Texas Workforce Commission's latest report, the Houston-Sugar Land-Baytown Metropolitan Statistical Area gained 66,300 jobs in the 12 months ending September 2011. That represents an increase of 2.6 percent. 6.6 months inventory of single-family homes is the lowest level since April 2010 and compares favorably to the national average of 8.5 months.